Washington, DC – The Court of Appeals for the District of Columbia Circuit issued a unanimous decision today reversing a recent district court stay and upholding the rule issued by the Department of Labor ensuring federal minimum wage and overtime protections for home care workers in all 50 states under the Fair Labor Standards Act (FLSA). Over the past year alone, hundreds of thousands of home care workers calling for $15 per hour wage gained the attention of presidential candidates, senior advocates, and everyday Americans. Today, their fight for equality and fair wages gained ground with the Court’s ruling upholding decades-overdue changes to the FLSA. When the Fair Labor Standards Act was created, people who worked in domestic settings—primarily women of color—were excluded from most of the protections the law provided for other working people. Since the Obama administration proposed extending these basic protections to this largely female and vastly underpaid workforce in 2013, home care workers have gone from fighting opposition from industry trade groups and for-profit companies to leading a national movement to ensure working women in one of the fastest growing healthcare roles are paid $15 an hour. 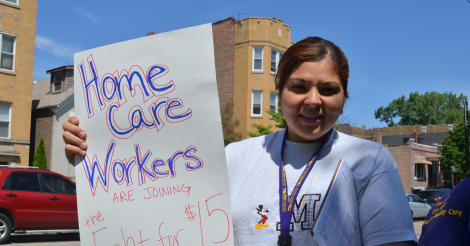 Thousands of home care workers joined in actions and rallies around the country on April 15, calling on members of Congress and elected officials to take a stand for a living wage and a union for home care workers. Since then, the movement has exploded, especially in states where home care workers are paid extremely low wages, including Georgia, Florida, Colorado, Nevada, and Ohio. In late June, 35,000 Massachusetts home care workers became the first in the nation to win $15 an hour starting wage in their state contract.